During 2000–2015, among adults aged 50–75 years, the use of colorectal cancer tests or procedures increased for all racial/ ethnic groups included in the analysis. Colorectal screening percentages more than doubled for non-Hispanic black, Hispanic, and non-Hispanic Asian adults during that period. Despite these increases, in 2015, the prevalence of colorectal cancer screening was higher among non-Hispanic white (65.6%) adults than among non-Hispanic black (60.3%), non-Hispanic Asian (52.1%), and Hispanic (47.4%) adults. The birth rate for teenagers aged 15–19 has fallen almost continuously since 1991, reaching historic lows for the nation every year since 2009. Despite declines in all racial and ethnic groups, teen birth rates continue to vary considerably by race and ethnicity. Moreover, the U.S. teen birth rate remains higher than in other industrialized countries. Childbearing by teenagers continues to be a matter of public concern. 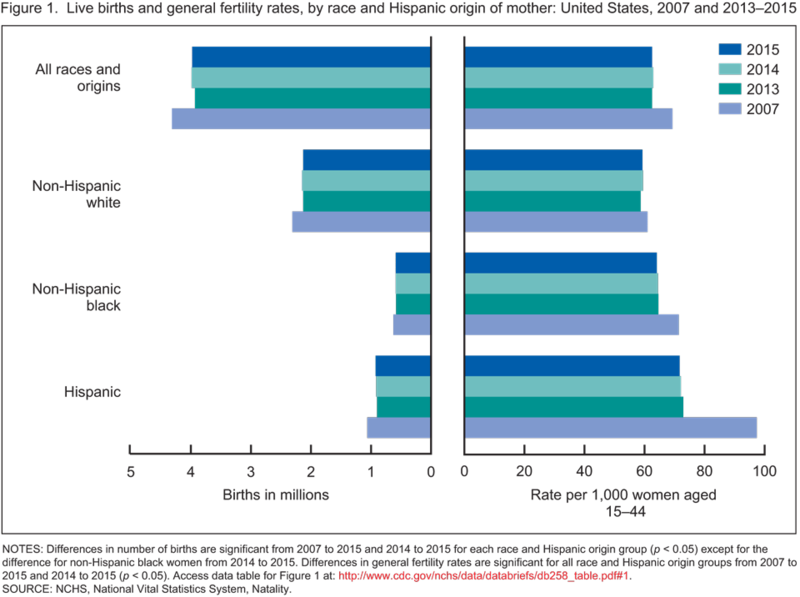 A new report presents the recent and long-term trends and disparity in teen childbearing by race and Hispanic origin. The teen birth rate declined to another historic low for the United States in 2015, down 8% from 2014 to 22.3 births per 1,000 females aged 15–19. The birth rates for teenagers aged 15–17 and 18–19 declined in 2015 to 9.9 and 40.7, respectively, which are record lows for both groups. In 2015, birth rates declined to 6.9 for Asian or Pacific Islander, 16.0 for non-Hispanic white, 25.7 for American Indian or Alaska Native, 31.8 for non-Hispanic black, and 34.9 for Hispanic female teenagers aged 15–19. Birth rates fell to record lows for nearly all race and Hispanic-origin groups of females aged 15–19, 15–17, and 18–19 in 2015. A new report from NCHS updates estimates for 15 selected health measures based on data from the January–March 2016 National Health Interview Survey (NHIS) and presents estimates from 1997 through 2014 for comparison. The 15 Early Release measures are being published prior to final data editing and final weighting to provide access to the most recent information from NHIS. The estimates will be updated as each new quarter of NHIS data becomes available. From 2000–2002 to 2013–2015, the percentage of older adults who met the 2008 federal guidelines for aerobic activity increased from 35.7% to 42.5% among persons aged 65–74 years, from 24.5% to 30.9% among persons aged 75–84 years, and from 11.9% to 19.4% among persons aged 85 years or older. The percentage who met the guidelines for muscle strengthening activities increased from 11.7% to 19.3% among those aged 65–74 years, from 9.6% to 14.6% among those aged 75–84 years, and from 6.5% to 10.4% among those aged 85 years or older. In both periods, within each age group participation declined with age and was lower for muscle strengthening activities compared with aerobic activities. Each Spotlight displays approximately four health indicators allowing users to visualize and interpret complex information from different data systems and Health, United States subject areas. This infographic features indicators from the report’s Health Care Expenditures & Payers subject area. An NCHS report presents several key demographic and maternal and infant health indicators using 2015 final birth data. Trends in general fertility rates, age-specific birth rates, cesarean and low-risk cesarean delivery, and preterm birth rates are presented. There were 3.978 million births in the United States in 2015, down less than 1% from 2014. The 2015 U.S. general fertility rate (births per 1,000 women aged 15–44) was down 1% from 2014. Birth rates dropped in 2015 to record lows among women under age 30 and rose for those aged 30–44. The cesarean delivery rate declined to 32.0% of births in 2015; the preterm birth rate rose slightly to 9.63% from 2014 to 2015. You are currently browsing the NCHStats blog archives for September, 2016.